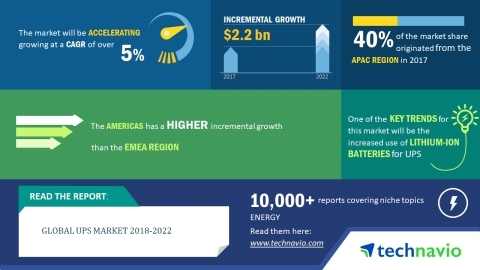 The global UPS market is expected to post a CAGR of over 5% during the period 2018-2022, according to the latest market research report by Technavio. A key factor driving the growth of the market is the rise in refining capacity. The oil and gas industry is growing post the sudden drop in crude oil prices in 2014. The increase in oil and gas exploration and refining is due to the increase in unconventional gas exploration and offshore exploration projects, which were put on hold due to price fluctuations. The global natural gas market is expected to experience growth. However, companies must incur expenses for downtime in the industry. Hence, the need to integrate UPS systems according to the needs of the industry is essential to reducing risks and, in turn, expenses. This market research report on the global UPS market 2018-2022 also provides an analysis of the most important trends expected to impact the market outlook during the forecast period. Technavio classifies an emerging trend as a major factor that has the potential to significantly impact the market and contribute to its growth or decline. Lithium-ion batteries have a high energy density, which allows them to be small and weightless. These batteries have a high charge-discharge rate and have a lower cost when compared to VRLA batteries. Some of the advantages include longer shelf-life, extended lifespan, thermal stability, and a current density of 1,470Wh/Kg. Requirement of small storage space and efficient UPS, large energy storage capacity, and longer battery life and low maintenance requirements are some of the other advantages of lithium-ion batteries. “Manufacturers have started developing lithium-ion batteries rather than VRLA batteries. Companies such as Schneider Electric are offering lithium-ion batteries that last twice as long and are weightless compared with conventional lead-acid batteries. The company integrated its smart UPS system, which can adapt to power variations, with lithium-ion batteries, specifically for data center applications for providing optimal performance during variations,” says a senior analyst at Technavio for research on energy storage. This market research report segments the global UPS market by application (non-residential and residential) and geographical regions (APAC, EMEA, and the Americas). The non-residential segment held the largest market share in 2017, accounting for nearly 91% of the market. This application segment is expected to dominate the global market throughout the forecast period. APAC led the market in 2017 with a market share of nearly 40%. This region is expected to dominate the market through 2022, with an increase in its market share by nearly 2%.